Apple's LED Cinema Display is the most elegantly designed monitor that I've used. The clean lines, aluminum build, and futuristic look help it stand out from the sea of cheap and plastic competitors. But like a lot of Apple products, it isn't without its flaws. Aside from the annoyingly reflective screen, my biggest issue with the monitor is its stand. The stand on the Cinema Display lacks any sort of vertical adjustment and the weak tilt system leaves a lot to be desired. Apple clearly chose to go with form over function. 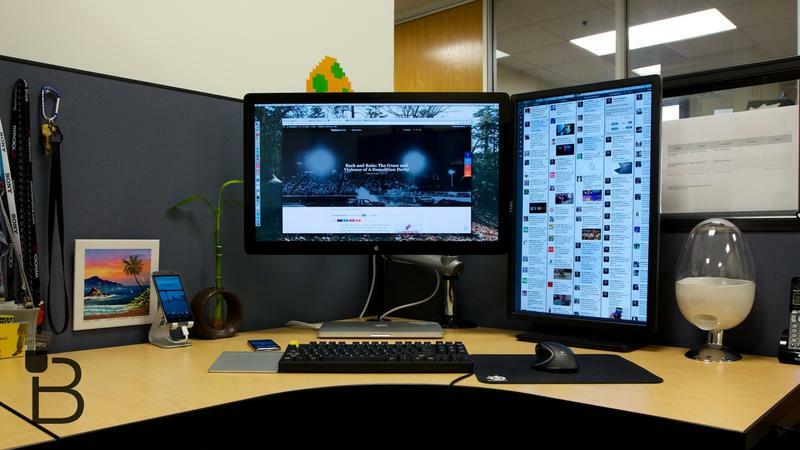 As my main monitor, the Cinema Display often causes my neck to feel sore after only a few hours of use. I noticed when looking directly at the display, my eyes line up directly with the iSight camera, which is located near the top edge of the monitor. In order to get a good look of the entire screen, I need to tilt my head down which, leads to the discomfort. To address this, I wanted a way to lift the monitor a few inches higher so that I could get the perfect viewing angle, and also ultimate comfort. The Freedom Arm from Ergotech did the trick. 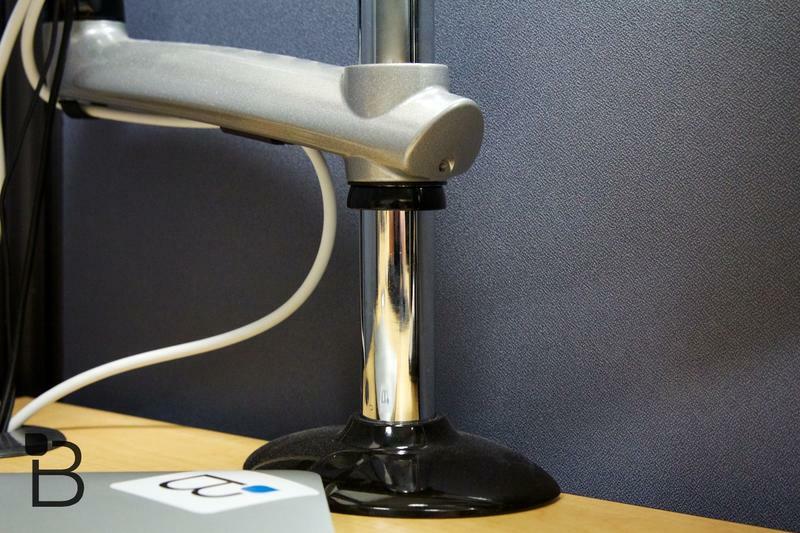 The Freedom Arm is an aftermarket monitor arm that lets you replace your static display stand with a flexible arm which, allows you to tilt, pan, and rotate your monitor into the perfect spot. It also gives you about 12-inches of vertical height adjustment. Need extra desk space while your computer is powered off? Just push your display away from your desk and free up space that would otherwise be lost with traditional monitor stands. It's simple and effortless. 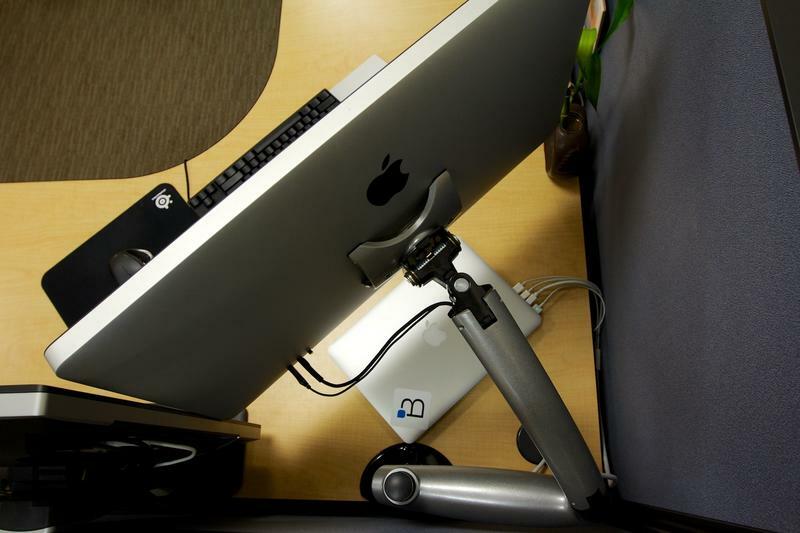 I tested the Ergotech Freedom Arm on a 27-inch Cinema Display, but the Freedom Arm is compatible with Thunderbolt Displays, iMacs, and most displays that have a VESA mount on the back. Quick side note: Apple displays do not come with VESA mounts out of the box. They require an additional $39 VESA plate adapter that Apple sells, but Ergotech is kind enough to include one of these adapters with the Freedom Arm, essentially saving you $39. I should also mention that the Freedom Arm has a minimum weight capacity of 20 pounds and a maximum weight capacity of 30.8 pounds, so don't plan on mounting anything larger than 30-inches. To achieve ergonomic perfection, a monitor should be about an arms length away, and your eyes should be aimed about 3-inches from the top edge of the screen. If you can't adjust your monitor to fit within these parameters, then you need a monitor arm. 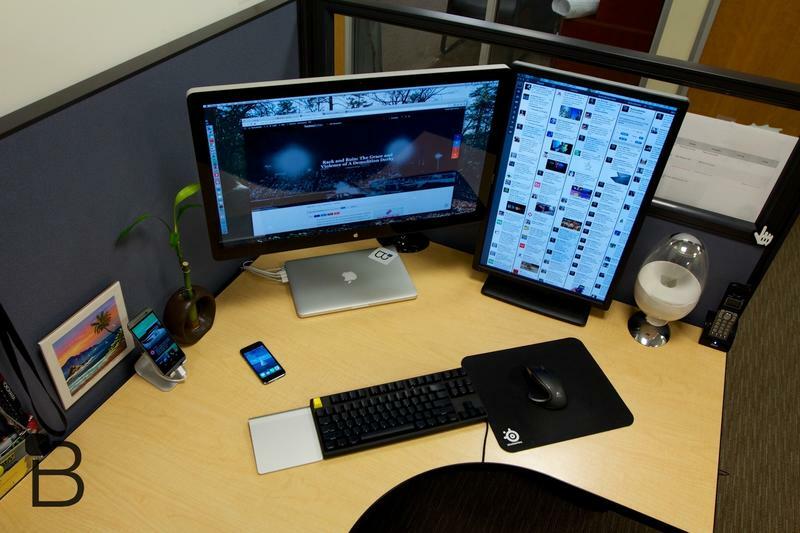 Not only will you have the optimum viewing experience but, as an added bonus, you'll also free up space on your desk. Now that I have the Freedom Arm installed, I can store my MacBook Pro directly under my monitor, creating an aesthetically pleasing look. Another benefit you'll get from Ergotech's Freedom Arm is the ability to rotate your monitor into portrait mode; spreadsheet wizards, Twitter soldiers, and coding master will really appreciate this feature. Like me, you might be worried that removing the stock Apple stand might ruin the elegant styling of the monitor, but the Freedom Arm is well built and matches the rest of the Cinema Display's aesthetics. 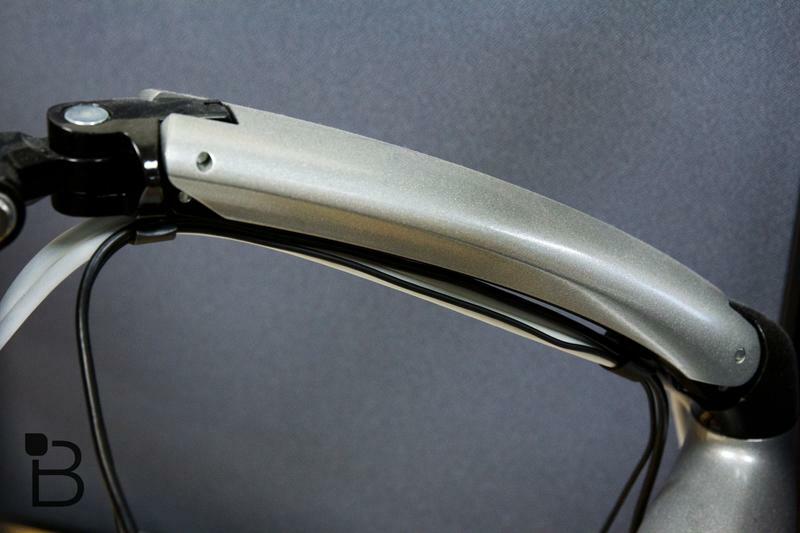 The Freedom Arm is constructed mostly out of aluminum and has useful features, such as cable management clips that help keep all of your cables tidy. I appreciate Ergotech including all of the tools you need to get the arm installed inside the box, too. 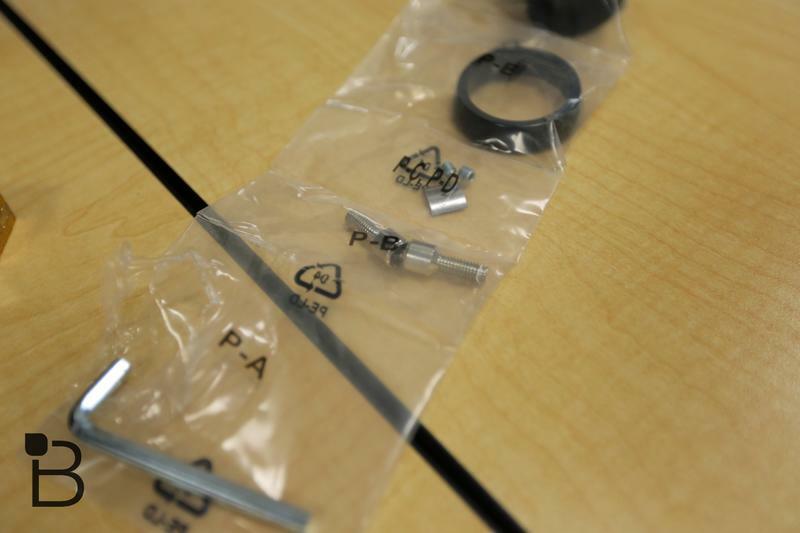 No need to pay extra for the Apple VESA mount adapter or T10 screwdrivers. The installation itself is also simple and the IKEA-like instructions are easy to follow. 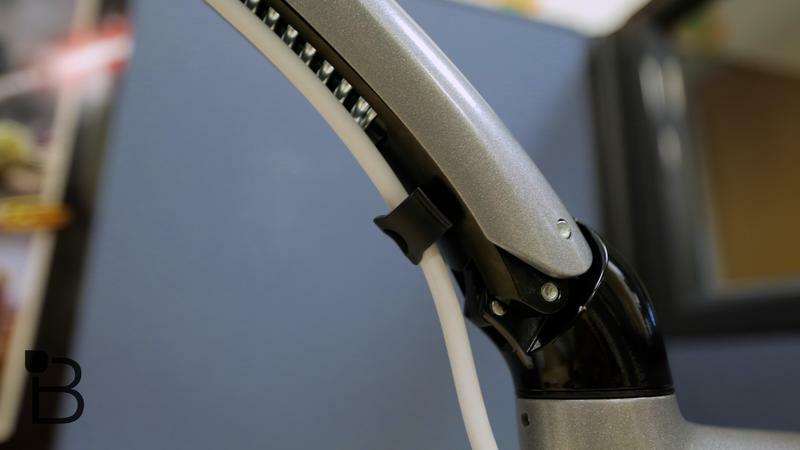 With a little elbow grease, the arm should take you less than 30 minutes to assemble and install. The Freedom Arm lists for $281, which isn't cheap, but if you do enough sleuthing you can find it for about half of that—try Amazon. Price-wise, this puts the Freedom Arm on par with other display arms, but don't forget you're getting a $39 VESA mount that's not included with most other monitor arms. The included tools are convenient, but be careful to not over tighten the screws as you might strip the included screwdriver like I did. If something had to be of lesser quality, I'm glad it was the tools that you'll use once, and not the arm itself. 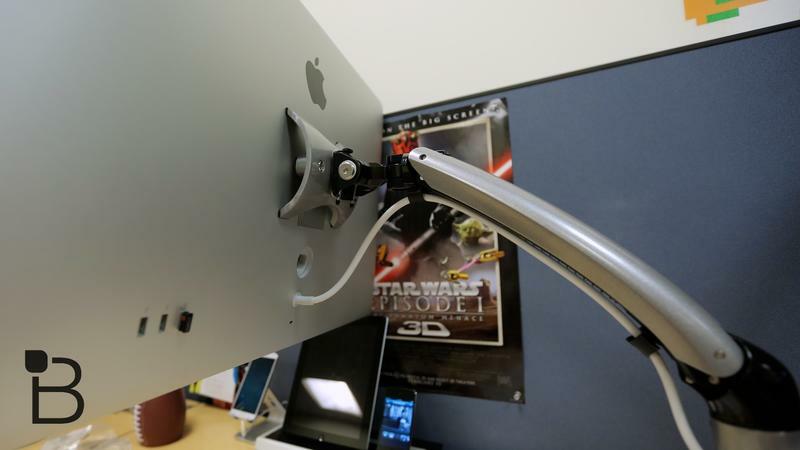 Speaking of tightening screws, do not attempt to install this monitor arm by yourself. It's definitely a two-man job, so don't risk damaging the arm or the display because you were too stubborn to ask for help. 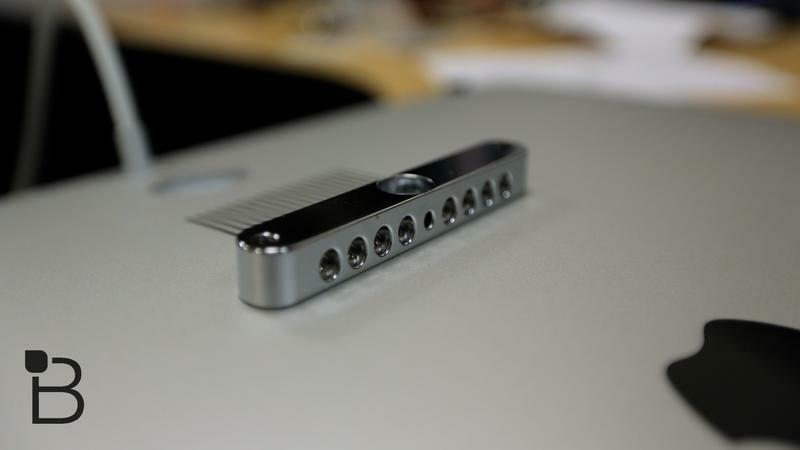 I wish the grey finish of the Freedom Arm matched the silver finish on the Apple display a little better. It isn't bad, but you can easily tell that it's an aftermarket accessory. 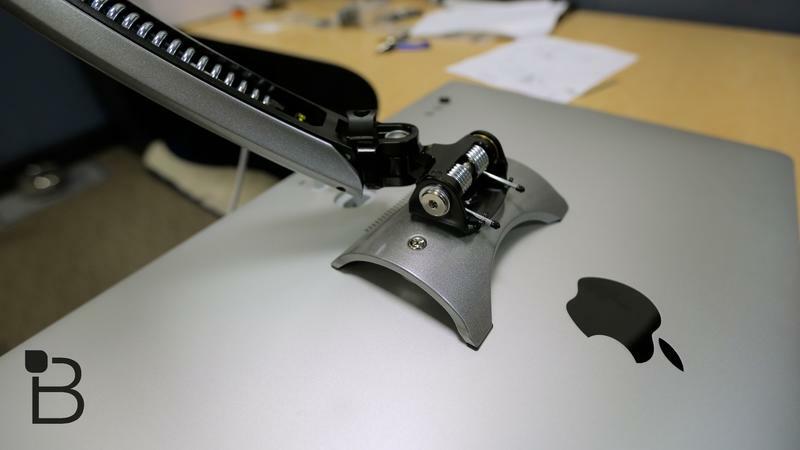 One last thing: if you have one of the new super-thin iMacs that were announced mid-2012, you won't be able to use the Freedom Arm (or any other monitor arm), because those iMacs do not have a removable stand. 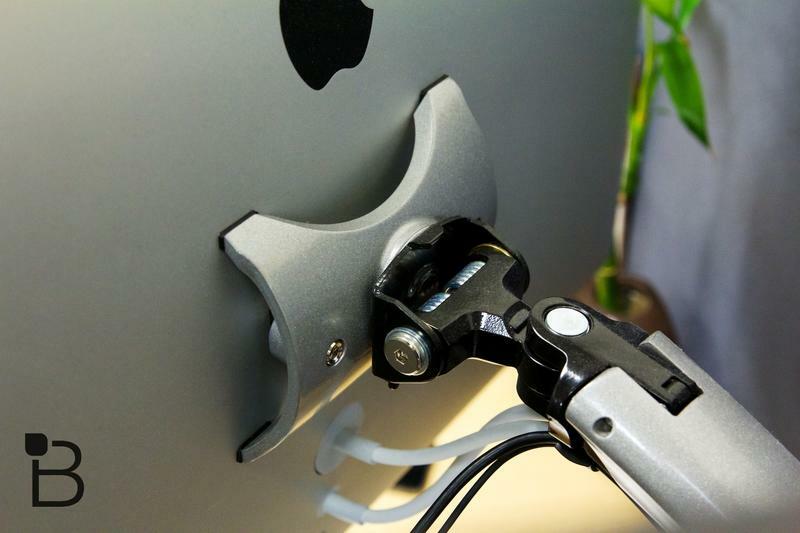 If you want to mount a new iMac to an arm or wall, you will need to first custom order an iMac that has a VESA mount on the back instead of a traditional stand. Does it Belong in the Herd? Absolutely. This is the best change I've made to my workspace, and it has not only improved things aesthetically, but also ergonomically. Now I can work more comfortably with optimum viewing angles, and also work for longer periods of time without any stiffness in my neck. 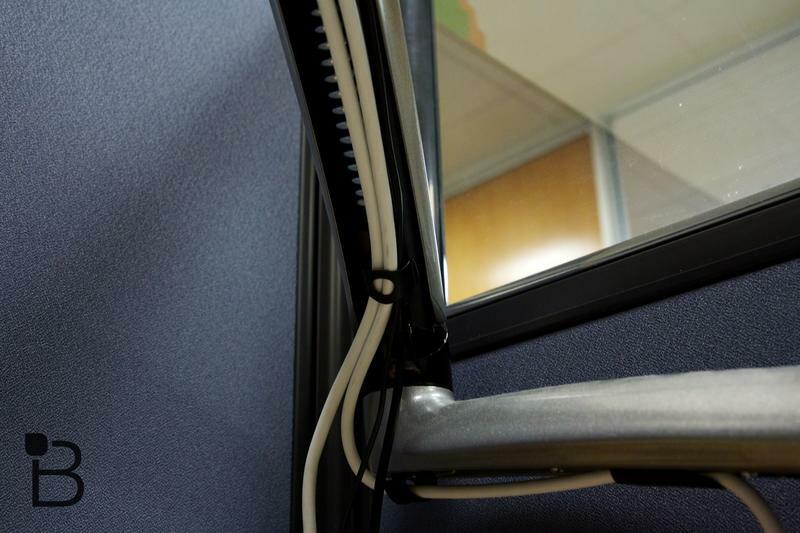 If you're like me and want more flexibility with your monitor, then check out the Freedom Arm from Ergotech. You won't regret it. Ralph helps manage all video related activities at TechnoBuffalo. Aside from being a tech head, he's also a photography hobbyist who enjoys shooting gadgets.